Sterling celebrates 25 years by hosting an international Treasure Hunt across the US and Canada. Climbers can follow @SterlingRope on Instagram for clues and have the chance to win 650 prizes! Sterling, a leading manufacturer of rope and life-safety equipment, today announced an international treasure hunt and Instagram contest for rock climbers and enthusiasts to celebrate its 25th anniversary. 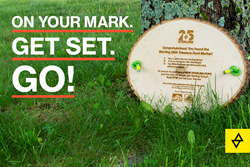 From June to November, Sterling will be partnering with Access Fund (@AccessFund) and the American Alpine Club (@AmericanAlpine) to place wooden #Sterling25 markers at 25 different crags across the US and Canada -- anywhere from the trailhead to the top of a climb -- and clues will be posted by @SterlingRope each week to help hunters find them. Beginning today, every Friday until November 16th @SterlingRope will post a photo and factual clue from its Instagram page. The first person to discover the #Sterling25 marker and post a photo with it tagging #Sterling25, @SterlingRope, @AccessFund, @AmericanAlpine will win a new Sterling rope. The next 25 people to post with the same marker will receive additional Sterling swag. Each day the marker goes unfound, another clue will be released to help treasure hunters win. Each clue will include a factual clue along with a photo. Factual Clue: Our first location is truly a needle in a haystack. Located in the largest, and most sparsely populated US State, where the rock is chossy, but the views are hard to beat! Photo Clue: To see the photo of the crag and get all the daily clues follow @SterlingRope on Instagram. Sterling has partnered with Access Fund and the American Alpine Club to identify and safely place markers in all 25 crag locations. Sterling is a premier rope and life-safety company dedicated to bringing climbing, rescue and utility safety products into the 21st century. For the past 25 years, Sterling has been developing and manufacturing the world’s finest ropes, hardware and related gear, giving climbers, arborists, firefighters and utility workers the ability to focus on the task at hand. From its headquarters in Biddeford, Maine, Sterling engineers, technologists and craftsmen build on advanced R&D, customer needs analysis, innovative manufacturing and stringent testing to perfect every aspect of production and create the industry’s most versatile and highly-rated equipment. Sterling ropes and cords fit seamlessly into any pack and enable the Freedom to Focus.